As we all know, money can become the primary focus of any relationship or organization. Our founders provided guidance in this area, in planning for Al‑Anon Family Groups (AFG) to remain focused on recovery, not financial needs. In line with it’s Seventh Tradition of being self-supporting, AFG relies solely on voluntary contributions from members, and the sale of Conference Approved Literature (CAL) to cover all its operational costs: facilities, personnel, public outreach, and more. The groups, as well as the World Service Office (WSO), decline contributions from non-members and accept no outside funding from government, foundations, or other agencies. If each member contributed two cents extra per week, that is approximately $75,000 a year. 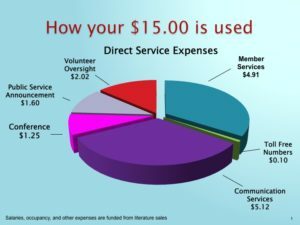 If every Al-Anon group in the USA sent an additional $15.00 per year to Al-Anon World Service Headquarters, annual expenses would be fully covered. Note: Personal contributions to WSO and to Montana AFG are tax-deductible. Contributions at local meetings are not tax-deductible. Contributions to your District and other areas are tax-deductible only if they have non-profit 501(c)(3) status. Al-Anon Family Group Headquarters, Inc. is a certified 501(c)(3) organization. Any donations are tax-exempt. *Montana Al-Anon, Inc. is a certified 501(c)(3) organization; donations are tax-exempt. *Montana AFG does not rent, sell, or exchange the names of it’s donors for any purpose. See the page for your District regarding financial contributions. To ensure that all Al-Anon/Alateen groups in Montana have an opportunity to affect the direction of Al-Anon as a whole through shared information between the groups and the World Service Conference (WSC). To collect and distribute information and reports, initiate projects, and make recommendations that support Al-Anon / Alateen at all levels (groups, districts, and WSC). The MT AFG Guidelines explain “how Al‑Anon is held together worldwide, how it is structured, how each member who is elected or appointed to a particular responsibility can best function in it. Since our growth depends on how well we serve the fellowship, this document can be helpful as a guide. It gives the methods that have long been standard practice in service work” area-wide. (Al-Anon/Alateen Service Manual, 2018-2021, p. 136).